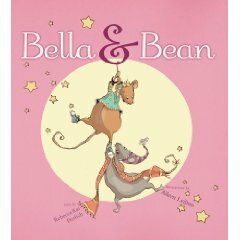 Visiting one of my favorite blogs, Literate Lives this morning I discovered a list of 10 favorite picture books and as I love lists and picture books I decided to jump squarely on the bandwagon and pick my 10 favs! The post is part of August 10 for 10: A Picture Book Event hosted by Cathy at Reflect and Refine. In her post she asks what 10 books are a must-have for the classroom. The lists are fantastic and definetely worth stopping over and taking a look. I had to stop reading them in order to write about my own (i'm going to try and not duplicate any books) even though each list includes some of my personal favorites! 1. Bella and Bean by Rebecca Kai Dotlich; illustrated by Aileen Leijten. I loved sharing this book with students, love how it leads into poetry and I could simply live in Leijten's illustrations. I reviewed it here. 2. Where the Wild Things Are by Maurice Sendak. I've loved this book for years and then some and love that kids get it is about imagination. I still have my poster book of his art from my college years. My husband has given me a collection of the Wild Things over the years for various anniversarys and birthdays. The kids in my story teepee loved it this year. 3. 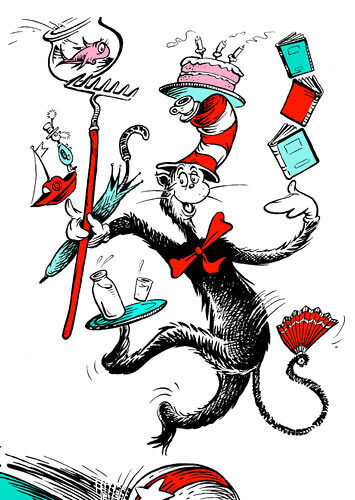 The Cat in the Hat by Dr. Seuss. Lots of kindergarten students haven't heard this book (well, at my school they haven't) It is a great read-aloud and I feel the same about Green Eggs and Ham but am not going to repeat authors. 4. The Water Hole by Graeme Base. This one offers surprises and kids love the tactileness of the actual circle in the book plus Base's illustrations pull them in and hold them. 5. Black and White by David Macaulay. I love the elements of this book and after reading it to older students they always want me to read it again. A great thinking book. 6. Guess How Much I Love You by Sam McBratney. A classic love story and it is wonderful to read it to prek, kindergarten and 1st grade students for the first time. My own little ones always mimicked the little bunnies actions. 7. 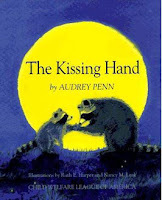 The Kissing Hand by Audrey Penn. I love sharing this one for same reasons as above with little ones. We take for granted reading to our own little ones because we are literature-minded but many parents don't read at home and these are two must reads to little ones. You'll wish you had a rocker and could just pull them up one by one for a snuggle. 8. The Very Hungry Caterpillar by Eric Carle. I read an article long ago that explained how young children feel a deep sense of comfort while listening to Eric Carle books. I do a Carle unit early in the year for kindergarten students and for the rest of the year they say "I'm going to read you a book by..." invariable two or three students will pipe up with "Eric Carle!??" It' s so cute and proves to me how much he sticks to them. 9. Stand Tall, Molly Lou Melon by Patty Lovell. Boys and girls alike adore her spunky and positive attitude. She is as sassy as The Recess Queen and The Ladybug Girl. Great book to show how important it is to simply be nice to each other. 10. Yoko by Rosemary Wells. Love what this book does for diversity and trying new experiences. Kids love to tell me the odd things they like to eat after I read this one. Oh, there are so many runners-up-worthy of another post sometime. Many of these would be on my own favorites list but I tried to stay focused on what students like in my reading teepee. Now I'm ready to go back and explore more of other's 10 on 10 lists.